Beneath the bloody waters of Crystal Lake, an immortal evil wakes and begins anew the cycle of grueling violence. Six months after the events of FREDDY VS. JASON VS. ASH, a power-hungry government bureaucrat unleashes the denizens of the Necronomicon – including the banished spirit of the Springwood Slasher, Freddy Krueger. But Ash Williams has checked his monster-hunting past at the door. 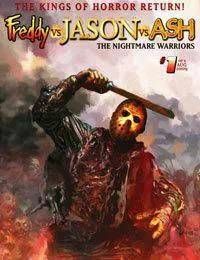 A Chosen One no more, he thinks that a life of domestic bliss and retail tending is his true calling – until the ghosts of the past show up to punch his clock again.The original creative team behind WildStorm and Dynamite Entertainments FREDDY VS. JASON VS. ASH proudly presents the bloody sequel to the sold-out smash horror crossover event! Featuring a triptych cover by Arthur Suydam (Marvel Zombies) to match the triptych cover from the original miniseries. Co-published with Dynamite Entertainment.